FILE - Russian Deputy Foreign Minister Sergei Ryabkov. Russian President Vladimir Putin has warned that if the U.S. deploys intermediate-range missiles in Europe, Russia will have to target the nations that would host them. A senior Russian diplomat warned Monday that the planned U.S. withdrawal from a Cold War-era arms control pact could critically upset stability in Europe. Deputy Foreign Minister Sergei Ryabkov said Monday that if the U.S. deploys intermediate-range missiles in Europe after opting out of the treaty banning their use, it will allow Washington to reach targets deep inside Russia. U.S. President Donald Trump declared his intention last month to withdraw from the 1987 Intermediate-Range Nuclear Forces (INF) Treaty over alleged Russian violations. Moscow has denied breaching the pact and accused Washington of violating it. Ryabkov warned that if the U.S. stations the currently banned missiles in Europe, Russia will have to mount an "efficient response." He didn't elaborate. "We won't be able to turn a blind eye to the potential deployment of new U.S. missiles on the territories where they may threaten Russia," he said, adding that such intermediate-range missiles would tilt the existing strategic balance between Russia and the U.S. "We would very much want not to get to the point of new missile crises. No one will benefit from those developments." Russian President Vladimir Putin has warned that if the U.S. deploys intermediate-range missiles in Europe, Russia will have to target the nations that would host them. Last week, a senior Russian lawmaker warned that Moscow also could respond by stationing its missiles on the territory of its allies. Ryabkov said that modern weapons technologies would make such U.S. deployment even more destabilizing than the positioning of U.S. and Soviet intermediate-range missiles in Europe in the early 1980s. FILE - U.S. President Ronald Reagan (R) and Soviet President Mikhail Gorbachev sign the Intermediate-Range Nuclear Forces (INF) treaty in the White House December 8 1987. 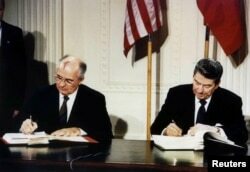 The INF Treaty, signed by U.S. President Ronald Reagan and Soviet leader Mikhail Gorbachev, was touted as a major boost to global stability, helping end the Cold War. The pact prohibited the U.S. and Russia from possessing, producing or test-flying ground-launched nuclear cruise and ballistic missiles with a range of 500 to 5,500 kilometers (300 to 3,400 miles). The U.S. has claimed that Russia violated the pact by testing and deploying a new ground-based cruise missile with a range exceeding 500 kilometers. Ryabkov charged that while Moscow and Washington have been talking about the issue for five years, the U.S. long refrained from detailing its complaints and only spelled them out a month ago. He added that the U.S. declared its intention to bail out of the treaty without waiting for a Russian answer. "It was yet another proof that our transparency has no effect on decisions made in Washington, they made up their mind long time ago and were just waiting for Russia to admit its guilt," Ryabkov said. The diplomat insisted that the missile the U.S. said was a breach of the treaty, 9M729, never has been tested for the range outlawed by the pact. He noted that Russia has provided a detailed explanation showing that the missile's design doesn't allow fitting additional fuel tanks to extend its range and also offered details on the vehicle serving as its mount. "It's hard to say what the U.S. accusations were based on," Ryabkov said. "It's possible that intelligence data were eagerly tweaked to serve a political order, or it could be that intelligence structures just made wrong assessments."